Can we do better than vegan leather? You may love classic leather biker or flying jackets, rock chick leather trousers or sensual thigh-high leather boots. It’s clear most ladies love handbags by the sales of all the Luxury brands. But if veganism is part of your way of loving the planet, you probably don’t choose animal hides. Yet it turns out the vegan alternatives some of us have relied on for decades are eco-disasters. Most faux leathers are made from petrochemical products like PVC or polyurethane or are textile-polymer composites. PVC manufacture generates non-biodegradable carcinogenic dioxins, while microfibre composites are made using dimethylformamide, creating pollution which affects the animals we hoped to spare. It’s pause for thought, but don’t despair; forward-thinking designers are already exploring more eco-friendly replacements for leather. Carta Giapponese Bag – A beautiful bag , the textile is composed of a special sustainable paper pulp. We’ve had a few options for years; here is some of the most innovative but less well known. Waxed cotton, as used in in Barbour jackets, is a convincing, washable substitute for patent leather. Coated denims can create a rock’n’roll leather-look. Cork’s green credentials are as beautiful as its grain, texture and natural colour. Clean to produce, sustainable and recyclable, it’s an ethical designer’s dream. Fabulous cork platform heels can be seen with many ethical vegan brands as well as luxury and high street brands. 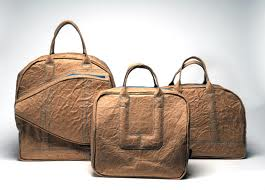 Portugal’s Pelcor produces cork skin, which adds a sophisticated refinement to its eco-friendly belts, bags and purses. Japanese paper place selling handmade paper, rolled from sustainable Japanese mulberry or similar bark, has been used for centuries to cover books and make clothing. This strong, malleable paper’s luxurious warmth and translucent beauty appealed to Bottega Veneta, who used it to make its gorgeous Carta Giapponese bag. Surely it’s ripe for renaissance as a fashion fabric. Experiments by Netherlander designer Ilvy Jacobs with the paper bag has produced extraordinary, durable handbags. Check out her funky, fabric-laminated cardboard collection at http://www.ilvyjacobs.nl. Americans, Engage Green create fabulous, chic bags from woven recycled paper strengthened with cotton. Wood leather, like http://www.filboflesswood.com, has been used in Dolce and Gabbana bags and shoes. When made using renewable wood bark and non-toxic preservatives it can be used to sustainably make tactile soft-leather-look coats. The distinctive distressed grey finish of faadn.com “leather” comes from its source material, slate. Yes, it’s sewable stone. German designer Christine Rochlitz of LuckyNelly, whose career so far has been about finding luxurious sustainable animal-friendly alternatives, favours Coolstone, cork skin and wood leather for her streetwise accessories. There are genuine alternatives to leather available – let’s support the manufacturers and designers who are working to bring them into the fashion mainstream. Thank you for this informative post (as well as the one on the Freedom of Animals handbags) – both of which I really enjoyed reading. As a fashion lover, I often struggle to reconcile my love (a strong word to use I know, but true nonetheless) for accessories with my belief system, and my developing thinking around the principles that business (and the products that they produce) need to incorporate in order for us to move towards a sustainable planet and society. So often we think that as individuals we don’t have much power to make a difference to the world’s aggressive consumption habits (of which mine form a part) or that the difference that we can make is limited to my and my family’s consumption of fast moving consumable goods (where it is sometimes easier (but by no means easy) to research and better understand how sustainable the products are). How refreshing to be reminded that luxury products like the Freedom of Animals handbags – which take ethical considerations into mind, and are actually beautiful (not all ‘Mother Hubbard’ looking which one may expect of ethically sourced products) actually do exist. Until now, I’ve tried to be implement sustainability principles in my clothing and accessory purchasing decisions by trying to buy fewer products of ‘better’ quality that I hope will last longer, and by looking at vintage (ie. ‘ second hand’) products. I also look forward to the development of a scorecard which can help make more informed decisions about purchasing luxury products – something which I intend to try out for sure!